I've revisited the Paul & Joe counter many times since I first wrote up their fall collection (link here), and it is a testament to my recent exercise in restraint that I caved for only one of the Color Powder CS, in Inseparables. Doesn't that swatch picture surprise you? When I first saw the color I didn't think I could pull it off at all. I thought it would turn out to be a light peach-apricot, but when combined the blush became coral. Not all corals look good on me, but this one does its job wonderfully. Inseparables is super pigmented. I suggest a light hand when picking up the color, otherwise you'll spend a lot of time blending it out on your cheeks. I can't reliably comment on wear time since I'm a serial face toucher, but from what I remember most of it stayed on throughout the day. For your own, contact Caroline or Alex at the Paul & Joe counter at Bergdorf Goodman. 212.872.8648. Paul & Joe is also available at Beauty Habit. Gorgeous shade! Love it on you. so, when are we going to see a write up on the RMS Beauty Lip2Cheek color that keeps showing up???? I love your hair. Would you actually wear it out like that (semi-tucked into your turtleneck) or is it just for the glamour shots? I would love to wear my hair like yours out in public but it might be too much? Thoughts? gorgeous! i always love your photos! This color is gorgeous on you--so so SO pretty! I haven't tried anything from Paul&Joe yet, but I definitely need this in my life! 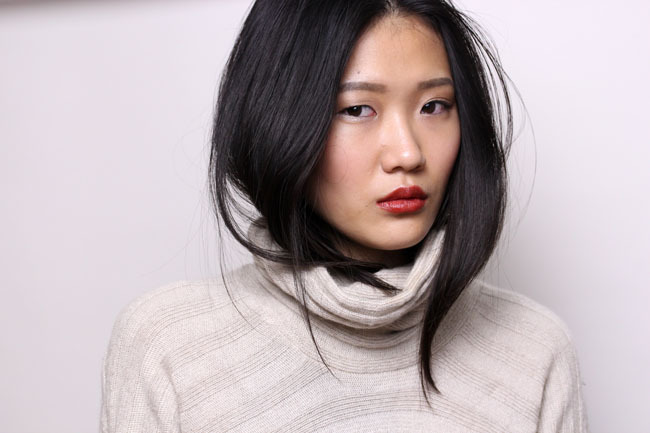 More info on the lovely turtleneck please! Rainy Days and Lattes- Thanks! Becca- Try this! It's super flattering. Trish- I bought it last year at Club Monaco. I don't think it's available anymore though. Posts like this make me jealous that makeup brands like these aren't available in my country! I love this color on you though, and the RMS Lip2Cheek is so pretty on you! Ooh, I love that lip colour. Could you do a post on your RMS Beauty items sometime? I'm curious about the brand but there are so few reviews around. Oh, what a gorgeous cheek duo! I'm not usually much for peaches (or apricots, and sometimes even corals), but I think I'll have to check this one out. Wandz, you wreak havoc on my wallet. 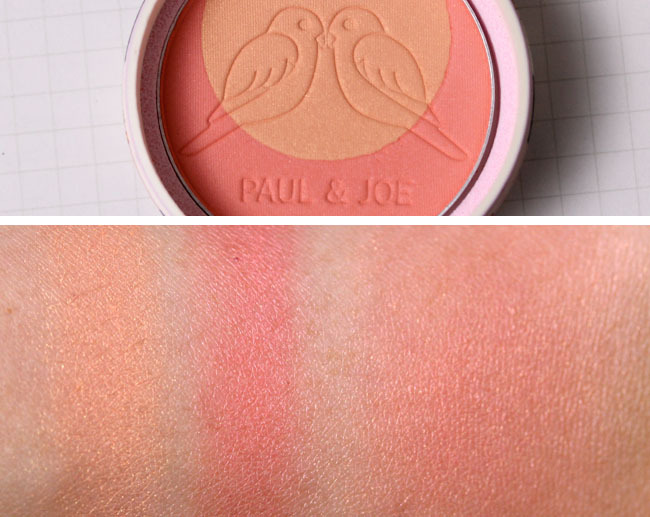 I ordered this Paul and Joe blush yesterday and their 304 lipstick this morning. P.S. I started using the Shu Muroto Shampoo & Conditioner and I love it. threetiis- I'm sorry to hear that :( RMS is available on zuneta.com though! Angela- ;) The Shu hair stuff is amazing, isn't it!? That looks very pretty on you. Could you say a bit more about the texture and finish (mat, shimmer, level of sheen compared to some other blushes, etc.)? Anonymous- Ah, I should have remembered that. It's not matte but only slightly shimmery to give depth to your blush. Similar, but has less of a sheen compared to Benefit Coralista. 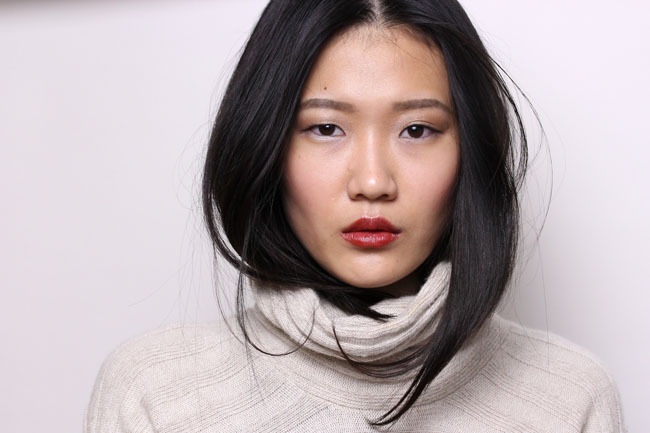 lovely, lovely look - i love it all from the sweater, to your hair, and of course the blush. :) your blog is such a pleasure to read!